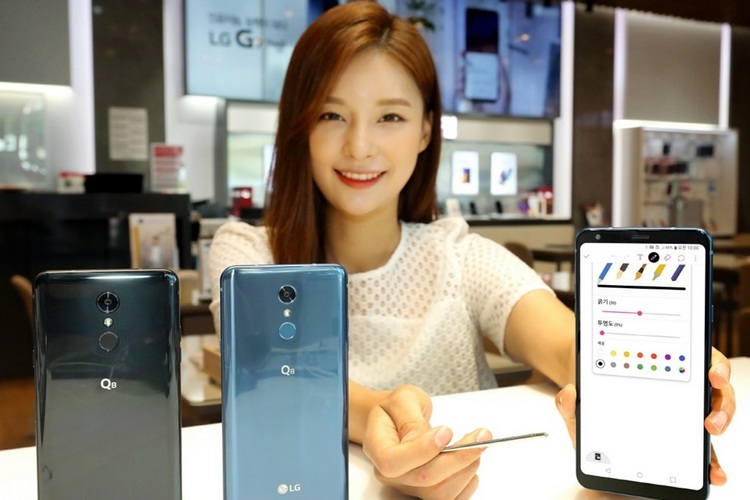 On the same day it launched the LG G7+ ThinQ in India, the South Korean consumer electronics company announced the latest iteration of its Q8 smartphone in its home country. The LG Q8 (2018) is an upper-mid-range smartphone, and is the successor to the original Q8 that was launched last year. It is priced at 539,000 Won (around Rs. 32,870), and will be available in Aurora Black and Moroccan Blue color options. The device touts high-durability with a military-grade build based on the MIL-STD 810G standard, and is IP68-certified, denoting resistance to dust and water. The device also offers DTS:X 3D Surround Sound and Hi-Fi Quad DAC technologies. It also supports LG Pay and comes with a stylus. The LG Q8 (2018) features a 6.2-inch full-HD+ (2160×1080 pixels) FullVision display with an 18:9 aspect ratio and 389ppi of pixel density. It is powered by the Qualcomm Snapdragon 450 SoC, and comes with 4GB of RAM alongside 64GB of built-in storage that can be expanded by way of a microSD card. The smartphone has a 16MP camera at the back with PDAF (phase detection autofocus) and an LED flash. Up front, the device sports a 5MP sensor with a 100-degree super wide-angle lens. There is also LG’s Q Lens feature that uses the built-in camera sensor to analyze the subject in the frame and find related information on the internet. The feature also allows users to read QR codes. In terms of connectivity, the LG Q8 (2018) supports 4G LTE, Wi-Fi 802.11 a/b/g/n/ac, Bluetooth v4.2, GPS/ A-GPS, and USB Type-C. There is a rear-facing fingerprint sensor and a ‘Pop memo’ feature that enables users to take notes from any screen when the stylus is unhinged. The LG Q8 (2018) runs Android 8.1 Oreo out-of-the-box and packs a 3,300mAh battery with support for Qualcomm’s Quick Charge 3.0. The LG Q8 (2018) has only been announced in South Korea, where it has been priced at 539,000 Won which is approximately Rs 32,870, and will be available in Aurora Black and Moroccan Blue colors. There’s no word right now on whether LG will launch the device in international markets including India.